Acer has slashed its 2011 target for tablet shipments by nearly 60%, or more than a half its initial aim for the year, Chairman JT Wang said at a shareholder meeting. The revised yearly target stands at between 2.5 and 3 million slates, down from the initial projection for 5 to 7 million shipped tablets. "The third quarter will be considerably more stable. It will be similar to the second quarter or better. The fourth quarter will be even better," Wang added. 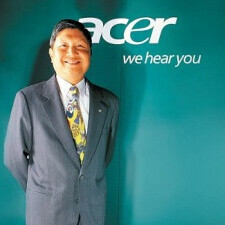 Acer also noted that it plans to see sales of tablet reach 800,000 units the second and third quarter each. The Taiwan-based company is the world's second-largest computer maker, but it is Acer's future strategy for emerging devices that led to major restructuring back in March. Former CEO Gianfranco Lanci stepped down in March over disagreements related to the company's tablet future. It has missed its last three quarterly forecasts and shares have sunk 30% since the Taiwanese have started restructuring. Currently, Acer only offers its 10-inch ICONIA TAB A500 running Honeycomb in the States and while it might not have the thin profile of the Samsung Galaxy Tab 10.1 or the prospect of 4G LTE connectivity on the Motorola XOOM, it could still entertain you with its sub $500 value. Feel free to also check out our detailed review of the Acer ICONIA TAB A500 to get all the details about the company's current standings in tablets.